Moved By Love From Surat To Mumbai To Pune! Yesterday, while stalled in Pune traffic with Sheetal, Atul, and Neha, a shirtless beggar with shades-of-grey beard knocked on the driver-side window of the car. After a recent retreat, Atul had spontaneously decided to spend 10 rupees on an act of kindness every day. For the rest of his life. A simple spirit with a heart of gold, Atul speaks with his shining eyes and sincerity of spirit more than his words. A steady meditator and volunteer for the Awakin Circles in Sheetal and Khushmita’s home, he's the kind to offer you a helping hand before you even think to ask, and simply moves you with the grace of his quiet humility. As the beggar’s knuckles tap the car window, without a flicker of a second thought in his mind, Atul pulls out his 10 rupee note. He hands it over to Sheetal, who rolls down the window, looks into the weathered man’s eyes for a moment, and hands him the bill. For a second, time stands still. The mid-traffic stillness breaks with the voice of the beggar. “Do you have shoes?” he asks. “I’ll come back later today and bring you a pair,” Sheetal answers, as the vehicles behind us honk, and Neha and my morning departure for Ahmedabad ticks closer. As we drive on, Sheetal casually translates the conversation into English for me. As we turn, I look back and notice the barefoot man is wearing nothing but a pair of faded shorts. As seamlessly as hearts overflowed to bring a pair of shoes to this man, the last couple weeks here in India have been witness to a whirlwind of love flowing from one city to another. Days stretch into weeks as one gathering fades into the next—as faces of all ages surface around a circle sharing, and a collective resonance orchestrates a tsunami of maitri at all moments and corners of the day, from car rides to meals to circles to meetings, scheduled and spontaneous. After two back-to-back Awakin Circles in Surat, preparations go full steam when we step into a spacious villa-esque home on the outskirts of the city, where Parag, Pinal, and Nipun S.’s 1.5-day 'head, hands, heart' retreat will take place for the local community. We find ourselves in a spacious countryside residence, which had been graciously gifted for the retreat. In the weeks leading up to it, local volunteer, Avni, crafts nonstop—whipping up quote-filled posters and artful nametags, picking up every kind of ambiance material imaginable (including thinking of things like natural room fresheners! ), and even transports a large pile of stones from one volunteer’s backyard to the retreat site to make a path! “Avni, how did you have time to make all these intricate posters?” I ask the busy dentist, as I pull out the 18th one from the pile. Meanwhile, Parag and his wife, Mita, orchestrate a massive collection of labor-of-love gifts to tag all the 50 participants. Mitaben herself designs “Jai Jagat” embroidered handbags and bracelets with wooden pendants (that read “me” on one side and “we” on the other). Mihir and Deven coordinate logistics, and Shaalini, Avni, and teenagers Zeal and Kiari (Pinal and Nipun S.’s daughters, who gathered their friends and spent the following weekend spreading smiles on the streets!) transform the vacant country home with all the homemade touches of love. Any time something is needed, Mihir is ready on point with an answer. And all this is just the day leading up to the retreat! The next day, the retreat unfolds mostly in the Gujarati language. My untrained foreign ears give way for my other senses to soak in the “notes between the words”. In just 1.5 days, the presence in the room elevates to another level, as circle after circle, share after share, a collective resonance of deepening values weaves everyone together. After a full day of stories, breakout discussions, we flow into a stunning silent dinner and evening of songs with Arun-dada and Rahul. The following morning, three-steps-and-a-bow strikes something in the matrix, and many of us are overwhelmed with tears. Something about the wordless humility of the invisible volunteers (including 6-year-old Simran, who smilingly sat drying off everyone’s feet after the bowing! ); something about the dedication and lightness of spirit that keeps Swara, Avni, and Rahul up at odd hours of night to prepare labor-of-love surprises for the next day; something about the open-hearted space that invites each of us to show up simply as ourselves-- melts us. And as we dissolve, we empty. And as we empty, we opened ourselves up to the visceral fullness of how everything in this world is connected to everyone thing else. As quickly as we convene, we depart. And Saturday afternoon, a crew of us pile into 2 cars to drive 10 hours to a retreat center at the foothills of Pune, where Sheetal, Khusmita, Sachi, and Meghna have organized a 3-day retreat for Awakin Circle hosts. Even the drive down becomes an excuse to hold circle. We debrief insights from the Surat gathering, share spontaneous stories around our diverse service journeys, brainstorm upcoming gatherings and emergent ripples, crack jokes and even meditate. Sleep-deprived from the nonstop events over the last half-week, Nipun Shah tirelessly drives us in his van for the whole 10 hours, as if simply sharing space together is a form of fuel. Past midnight, we finally pull into the retreat center gates, and the headlights shed light on Nimo, Meghna, Sachi, Sheetal and Khushmita’s wide smiles, waving arms, and feet tapping in a ‘happy dance’. 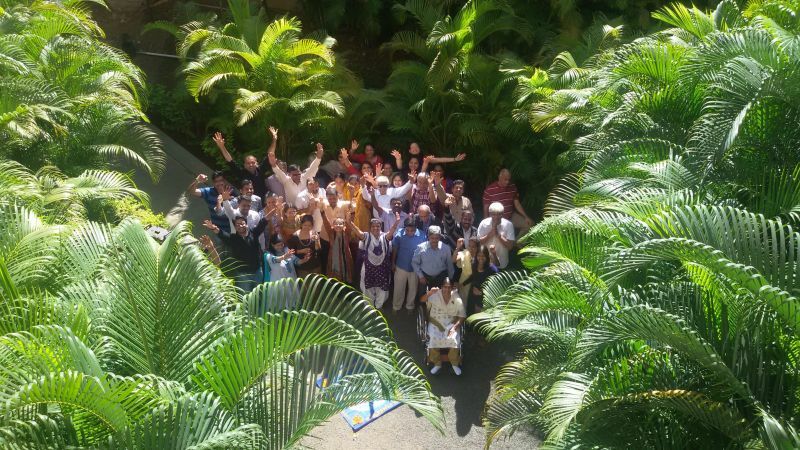 :) They usher us into the idyllic retreat center dorms and next morning we awake to a new configuration of love warriors— this time a crew of 45 folks who share the thread of anchoring Awakin Circles. Upon assembling around the circle, Sheetal welcomes us “home” and Meghna begins the circle of sharing with her genuine story of stumbling upon the Awakin Circle in Santa Clara as a young college student, and how years later, when she had the opportunity to host such circles herself, both in Mumbai and now Ahmedabad, she has received so much from the experience. “It’s not that I’m hosting Awakin circles. The circles are actually hosting me,” she reflects. In the vibrant backdrop of labor-of-love decorations, we listen to story after story of the streams of blessings and conditions— all the left turns and right—that led us to enter a space of stillness and service that has manifested as an Awakin Circle in Bangalore or Mumbai, Pune or Delhi, Spain, California, Dubai and beyond. That afternoon and evening, we hear a few folks’ stories from the heart, sit for an hour of stillness together, and flow into more stories and dinner. For the next two days, we share insights and stories, discuss edges and best practices, are surprised with video messages from Awakin Bhutan, South San Francisco, Detroit, and Santa Clara, and sit in stillness. Every moment is brimming with love. Neeti and Aabha make round after round to make sure everyone is well fed and healthy. As we file into the room one morning, Aabha welcomes everyone with a small sweet. Every afternoon, she and Nimo serve up replenishing smoothies. Paragbhai brings boxes of Surat’s specialty biscuits for breakfast and tea time. Secret angels tiptoe to all the rooms at night, leaving each attendee to find a gift with a thoughtful, handwritten note outside their door in the morning. Various voice magicians bless us with a soulful prayer at the start. Even the center staff joins us for the silent dinner one evening—and are even moved to serve the volunteers afterwards! As quickly as it started, the three days are over once again, and our various carpools disperse to Baroda and Surat, Mumbai and Pune. With the Mumbai posse, a crew of us drive to Nipun’s talk with students at a social sciences university, followed by an Awakin Circle at Rahul and Kinnari’s home. Along the way, we brainstorm with Anupreet and Goli on ways to engage small acts of great love at the Ayurvedic conference they are headed to next. When we get stuck in unexpected traffic, no one is perplexed, as it becomes an excuse for a deeper-dive circle of sharing. In Mumbai's high-speed and highly driven culture, small tidal waves of love greet us at every corner. When Darpan, Madhur, and I pull up to Rahul and Kinnari’s home for Awakin Circle, their building is unmistakable. The entry way is a-glow with artfully arranged candles and flowers and a loving sign that instructs you to leave your shoes at the bottom of the staircase. As we arrive on their floor, we are Jignasha and Shaalini envelope us in warm hugs, and the living room is lit up with shining faces of the Awakin Mumbai community, Rahul’s mother’s singing group, and smiling family members and friends. After an hour of meditation, Nipun shares some stories (in Gujarati!) and Q&A, and a crew of the local posse silently plate the food and go on rounds offering seconds and thirds. Small surprises spring up at each corner. Rahul’s mother’s singing group delightfully offers up a song. Someone gifts everyone a quote handwritten on colored paper, which we later learn is an offering from our gracious host, Kinnari-- and who had meditated before writing each one! University students Darpan and Drishti naturally step in to fill any gap-- whether in switching on lights at just the right time, stepping in to translate, or serving food with incredible care. At Sachi's circle the next night, their father explains how his kids inspired him to serve: "They got drawn towards all this, and now I'm learning from and following them," he says with a hearty smile. Wednesday is filled with planned and unplanned circles at various homes. Spontaneous stories of everyday heroes, like Richard and his art of interviewing, Rev Heng Sure, Pancho, Pavi and her stunning poetry, and Peace Pilgrim unfold at various points, mixed in with questions of black swans, life and death, and small moments of great love. Vijay Uncle and Karupa Aunty’s son Sameer, coincidentally is visiting from Seattle, even offers a stunning poem for all of us. He decides to join for Sachi’s Awakin Circle that evening, and even insists on driving us. We’re amazed by the ease with which he drives through Mumbai traffic, despite the jet-lag and being accustomed to US right-side-of-the-road driving. But the spirit of love that unfolds in these simple circles of sharing seems to dissolve all obstacles. Sachi's mom cooks dinner for around 70 folks, as the ever-expanding number of RSVPs shifts the gathering from their living room to another to, finally, a friendly, mom-and-son-owned yoga studio. Bunch of local folks transport piles of meditation mats, large pots of food, and decor. 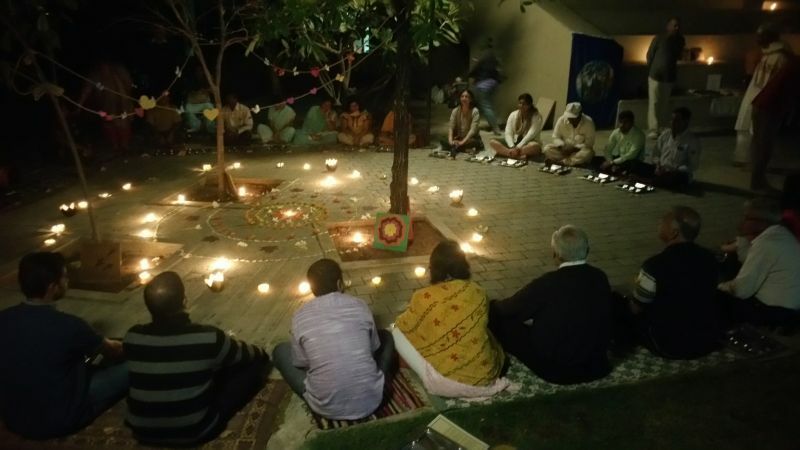 On Thursday night we’re back in Pune, for an Awakin Circle at Sheetal and Khushmita’s home. A crew of local (and visiting) crew whip up homecooked food for 100+ folks while another team transforms the entryway into a stunning hall of kindness-- with paper-leaf art, kindness tables, and vibrant chalk designs on the stone path leading up to the door. The following morning, 50 of us somehow find ourselves graciously welcomed into a Q&A session between Dada Vaswani and Nipun. In 45 minutes, barely a dry eye could be found in the crowd, as the depth of Dada Vaswani’s presence soaked into each of us. By noon, six of us zipped over to a university an hour away for Smita-ben’s 3-day retreat with 50 NGO leaders this past weekend. Moment after moment of grace stilled our hearts, as small acts of kindness unfolded continuously on the sidelines. Gitanjali and Smita-ben’s niece Neha woke up early to decorate the meeting room and hallways with flower rangolis. One participant spent her break time playing with children outside the campus, and brought back gifts of stones, leaves, and flowers that the children collected for all the retreat participants. On the evening of the second day, our friends from Spain as well as the local Pune crew even swooped in just for the opportunity to setup and serve a silent dinner for everyone. And as invisibly as they came, they left, with no one even knowing their names. "A dog is traveling on Krishna's chariot, and lo and behold, when the dog wagged its tail to the right, the chariot turned to the right. And when he wagged it left, the chariot turned to the left. It was an example of correlation, not causation, and it would have been nothing short of ludicrous for the dog to actually believe it was controlling the chariot with its tail. Yet, that is precisely how our arrogance deceives us. We forget that behind each one of us lies an invisible stream of conditions that supports our every move." Like the shoeless beggar in Pune blessed us with the opportunity to practice generosity, each face or conversation or situation we encounter becomes an instrument to tune into our interconnections. As each day fades into dusk into early morning into dawn, each gathering carries a tune unique to its point of time and place, while also unleashing a subtlety of presence-- of which each moment carries a tapestry of roots—an anthem of consciousness, a spirit, a bhav—that transcends the spoken word. "What a privilege it is to be keepers of each others’ highest potential." Beautiful write-up Awwwdreyji! Thank you for giving all of us a glimpse into the flowing stream of goodness! Thank you for navigating this whirlwind of kindness for us, Audrey. So grateful to experience all the connections, retreats, Awakin Circles, and acts of kindness through your articulate words and wide-open eyes. I feel like I was there. My heart is full of joy and gratitude. Beautiful write up - thank you for sharing! Thanks for making the ripples visible. Just Great! The writing is so lucid, I felt as if I was there. Small acts of kindness leads to wonderful positive feeling and creates a very good positivity! beautiful write up audrey!! thanks for capturing the love and energy into such moving words. Beautiful writing Audrey. I was fortunate to be invited by Smitaben for the retreat at FLAME University, Pune where I met all the wonderful people and experienced love, simple and pure. May your tribe grow to cover the entire world. Amen.